The record is made up of 1 volume (361 folios). It was created in 11 Sep 1925-23 Feb 1934. It was written in English and Arabic. The original is part of the British Library: India Office The department of the British Government to which the Government of India reported between 1858 and 1947. The successor to the Court of Directors. Records and Private Papers. This transcription is created automatically. It may contain errors. received hy me from Mr. Slkington. its enclosure to the Government of India. I have the honour to he. Political Sesident in the Persian Gulf Historically used by the British to refer to the sea area between the Arabian Peninsula and Iran. Often referred to as The Gulf or the Arabian Gulf. . The volume contains correspondence between the Political Agent A mid-ranking political representative (equivalent to a Consul) from the diplomatic corps of the Government of India or one of its subordinate provincial governments, in charge of a Political Agency. at Bahrain and the Political Resident A senior ranking political representative (equivalent to a Consul General) from the diplomatic corps of the Government of India or one of its subordinate provincial governments, in charge of a Political Residency. at Bushire, the Shaikh of Qatar and the Anglo-Persian Oil Company (APOC) representatives, including Haji 'Abdullah Williamson, the Colonial Office and the Secretary of State for Colonies in London, regarding geologic surveys of Qatar and Trucial States, the concession of an exploration license in 1926 and its renewal with an agreement between the ‘Abdullāh bin Jāsim Āl Thānī, Sheikh of Qatar, and APOC, in 1932 (folios 57-59). 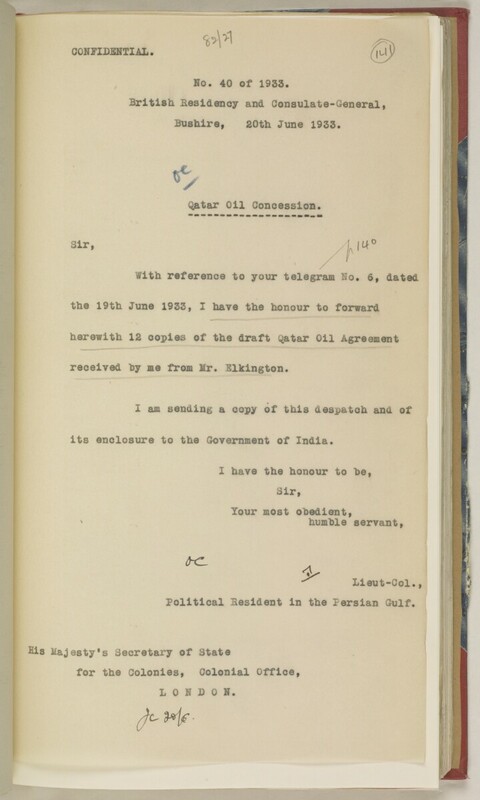 The volume also contains notes of meetings and correspondence regarding the early stages of the negotiations for the oil concession in Qatar, and the 1933 draft oil concessions (folios 120-125 and 248-268), with comments. There are documents in Arabic, mainly letters to and from the Sheikh of Qatar. Some of the documents in the volume are marked as confidential. The documents in the volume are mostly arranged in chronological order. There are notes at the end of the volume, (folios 331-345). The file notes are arranged chronologically and refer to documents within the file; they give a brief description of the correspondence with reference numbers in red crayon, which refer back to that correspondence in the volume. The foliation is written in pencil, circled, and can be found in the top right corner of the recto The front of a sheet of paper or leaf, often abbreviated to 'r'. side of each folio. The numbering commences at the first folio with 1, 1A, 1B, 1C and 1D; then 2-47; 48 and 48A; 49-97; 98, 98A, 98B and 98C; 99-283; 284 and 284A; 285-308; 309 and 309A; 310-313; 314 and 314A; 315-337; 338 and 338A and terminates with 349, which is the last number given to the final folio of the volume. Copy and paste the code below into your web page where you would like to embed the image.